Hey guys! Since it's the last long weekend of the summer and I would much rather be doing a little bit of relaxing outside than hanging out at my computer, I'm going to make this one a little bit brief. 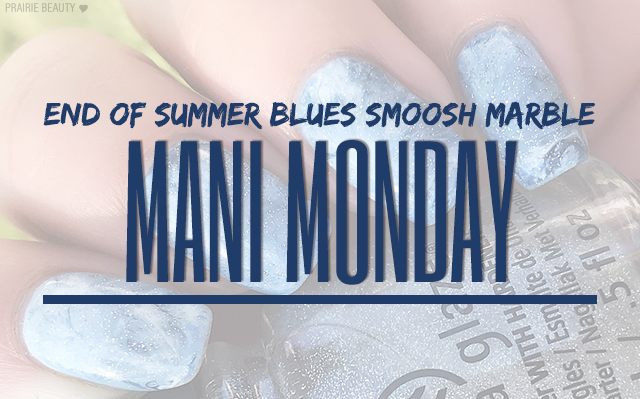 With the #CBBxManiMonday theme being The End Of Summer, I really had to wrack my brains to see what I wanted to put together... and then it hit me! The changing of seasons is always a little bit of a struggle for me - anxiety :( - but the end of summer always comes with its own sort of mourning for the long, hot days and balmy nights and the best way I could think of to communicate that was... blue! 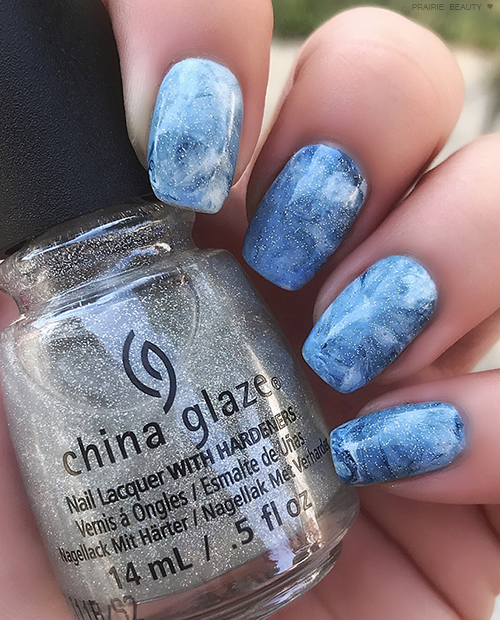 I absolutely love a smoosh marble, which I feel is always cool and interesting when you choose the right colours. 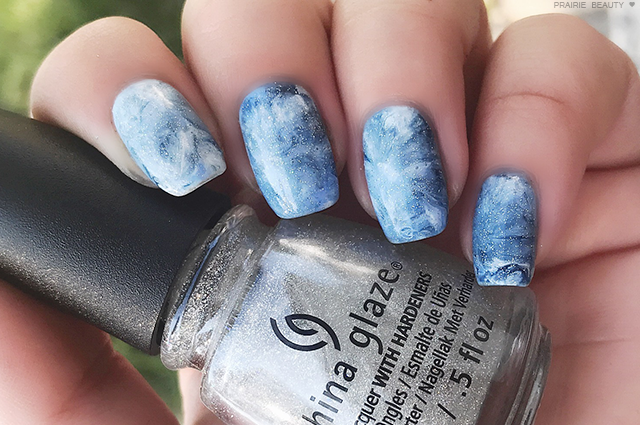 For the mani, I started with a one coat base of Pure Ice's Bikini, which is a really, really light ashy blue shade. For the smoosh, I added dots of Bikini, as well as Ceramic Glaze's Pure, Rimmel's Bestival Blue, and essence's Royal Blue. I was careful not too add too much of the white or the deepest blue so that they didn't take over the mani and I got a good blend of all four blue shades. I smooshed it directly onto the nails several times until I got the blend that I wanted and then cleaned up first with a dotting tool to remove excess polish and then a clean up brush with acetone. To finish, I added a coat of China Glaze's Fairy Dust and a nice thick coat of essence Gel Top Coat and voila! Are you guys feeling the end of summer blues too? Be sure to head over to Cosmetic Proof, See The World In PINK, and Tea & Nail Polish today to check out their interpretations on the End Of Summer theme!